Redheads take a bow , we now we have our own haircare line. Whether you are a faux redhead, or like me, natural, you can use the new Reviving Reds from Pureology. I am sure you've heard by now that colored red is the hardest hair color to keep fresh. It fades quick and needs attention to keep it vibrant. The full line consists of Reviving Red Shamp'Oil ( $ 29), Conditioner ( $29), Illuminating Caring Oil( $ 32) and Red or Copper Reflect Enhancer ($ 40). The Shamp'Oil is like their Precious Oils one and very moisturizing. More than my hair needs, but if you are dry, this is exactly what you need. That, the conditioner and oil are not color depositing but help to maintain healthy hair. 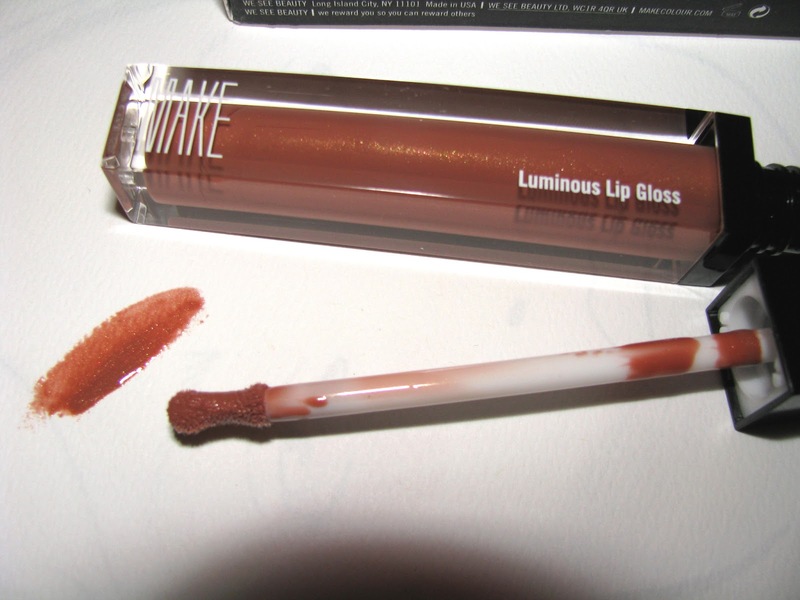 The Red or Copper Reflects Enhancer is the unique product in the line. Even though my hair is natural it has changed in the past year to a be a little darker as well as losing the highlights that the summer sun and pool water gives it. This is made to boost color a bit so I gave the Copper one a try. I think it made my hair brighter by a little but I didn't notice a lot of color. What it did do was uber condition . Hair felt like silk when wet and it had loads of shine when dry. This is a really good idea for in between use. 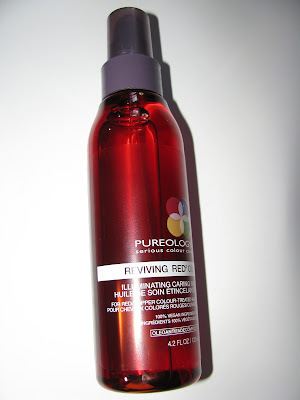 Pureology recommends it to be used once a week. Each box has 4 tubes. You work the Enhancer in , leave on for 5 minutes and then rinse. 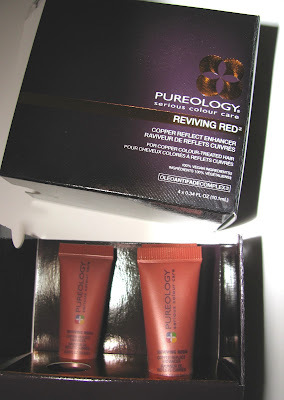 Pureology does rec wearing gloves but I didn't and it was fine. The Illuminating Oil here is almost gel like and non greasy yet moisturzing. Great for ends. Oils used are sesame and sunflower and it leaves no residue or overall feel of oil on hair. Good haircare really makes a difference, so if you are red, or want to go red, check this to help keep your color in tip top shape. 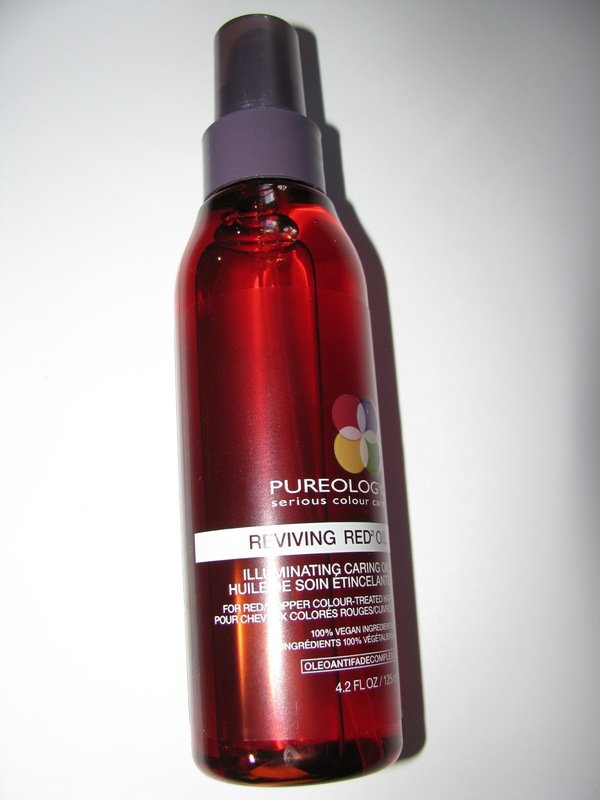 Pureology's Reviving Red is sulfate free and 100 % vegan ingredients. It's rare to see pear in products, and it's a scent I usually like. There was of course the old Bath and Body Works one, Pearberry and Victoria's Secret still has the always nice Pear Glace . 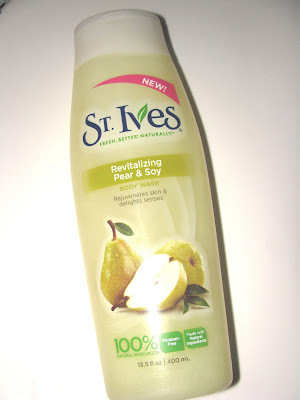 Well there's a new pear in town , St. Ives Revitalizing Pear and Soy Body Wash. This new wash is a hydrating one, and looks like a gel/cream hybrid. Nothing too heavy but still moisturizing. There is actual pear extract in there as well, more than generic "fragrance " on the label. That is there too, along with soymilk. 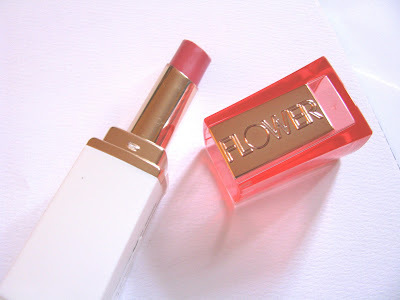 Yesterday was Flower Beauty's Lip Service Lip Butter. 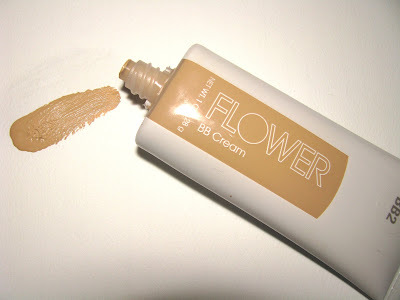 Today it's the Stick Foundation and BB Cream. One of the exciting finds was that they have a stick foundation. I love stick foundations and they can be hard to find. 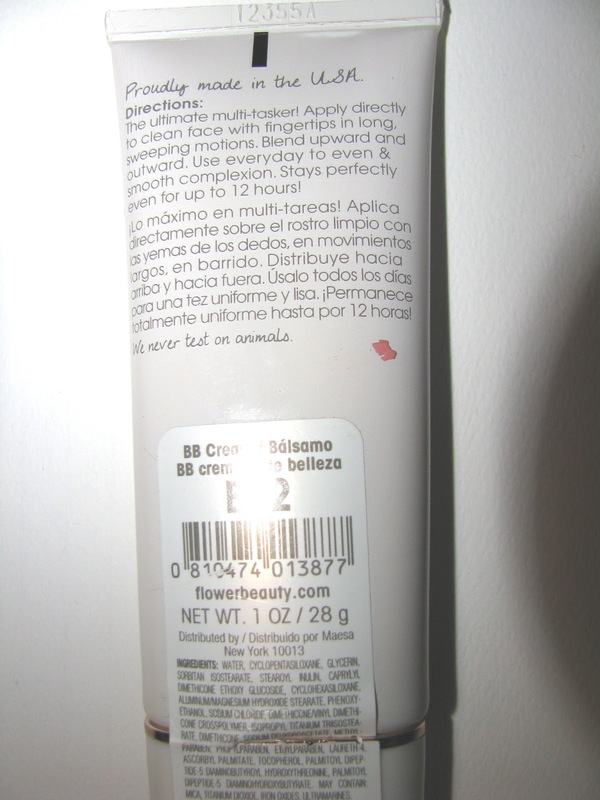 One of my holy grail foundations used to be L'Oreal Quick Stick. Man, that was good and I stockpiled when they dc'd it. Of course in the intervening years I've found many more great foundations but not many sticks. And can I say how much I miss Max Factor's Pan Stick ? But I have a supply of that too. There are a few out there , Tom Ford makes an amazing one, but at $ 78 it's not within easy reach . Bobbi Brown's is great and a bit better priced. As far as I know, though, there are no mass markets ones out there . Until now. Flower's stick foundation offers medium, buildable coverage. 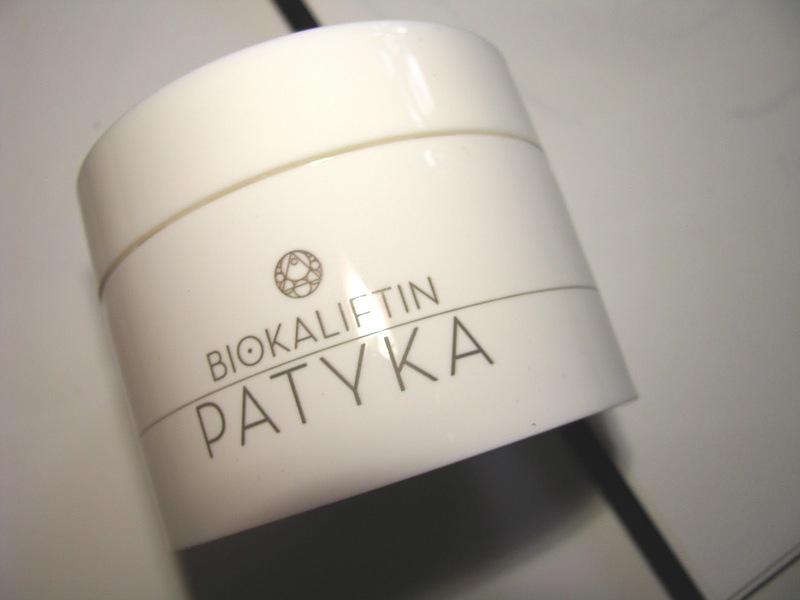 It has a soft feel on skin but is also feels emollient. 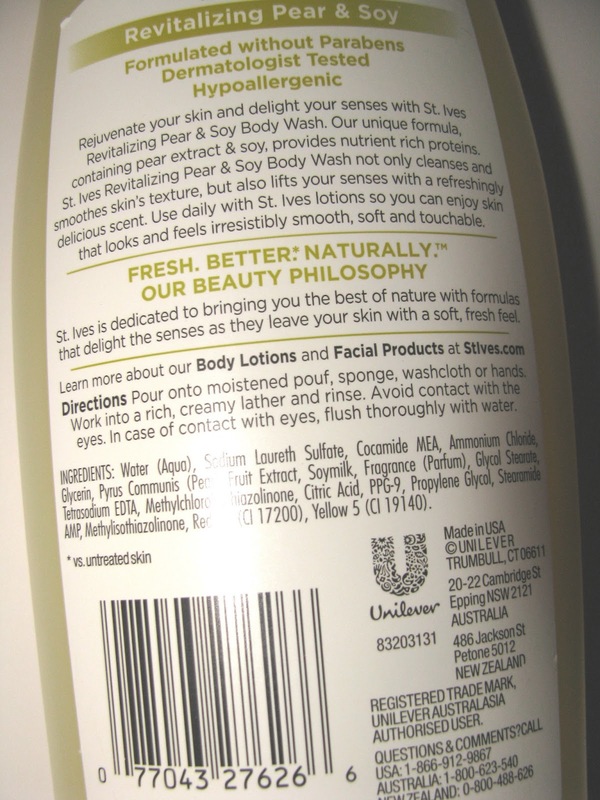 Due to the oil ingredients that make it emollient, it unfortunately won't work for my skin. 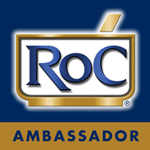 Ingredients include corn , cottonseed and castor oils as well as shea butter. 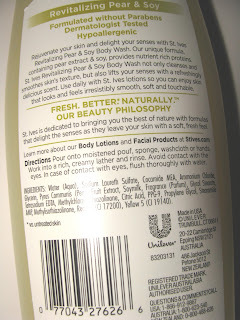 However, it is nice and if you have normal to dry skin then it might work for you. Sticks like these make great take alongs for easy touch ups in addition to all over use. 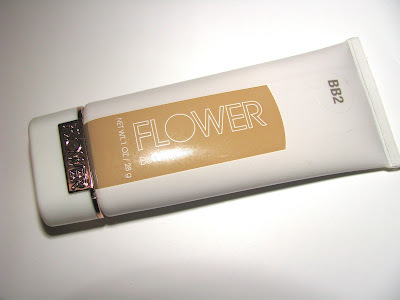 The BB Cream is a nice addition to the BB scene as it gives good coverage, something often missing in drugstore brands. 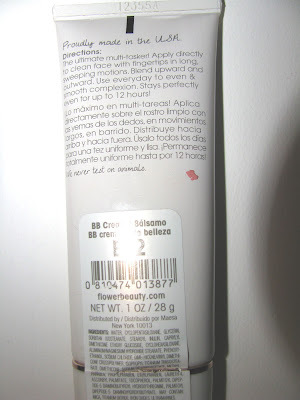 It covers flaws, evens tone and is lightly moisturizing but not heavy . It is missing SPF but other than that performs as well as some of my higher end brands. Bonus points too, for the upmarket looking packaging on the BB. 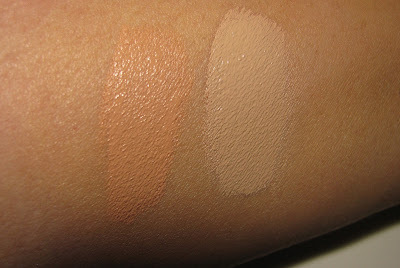 My shade is BB2 in the BB Cream( $ 12.98) , SF2 in the Foundation( $ 6.98). Have you tried Flower by Drew Barrymore yet? I finally have and it's really good. It was hard with this brand as it's exclusively at Wal Mart and I don't have much love for them. I have personal experience with the Wal Mart machine . At the same time, it's new makeup . So of course I'm interested and probably not the only one. Plus good makeup at a good price, don't want to ignore that. I've tried a few things from the line and came away impressed. Breaking it into 2 posts , today is the Lip Service Lip Butter. Next up will be BB and foundation. Lip Butters /Balms are a big thing right now, happily for those of us who love them. Flower's are nicely moisturizing and creamy and the moisture lasted long. The finish is medium pigment, not sheer but not heavy with some shine. One swipe does a good job . There is a slight fragrance of rose, and no taste. My shade is Princess and The Peony and I have to say I am quite liking these and this shade. Which is not my usual color. Peony is great for now and in Spring . 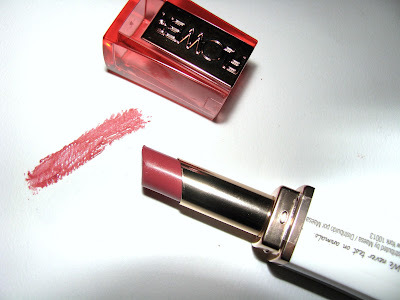 The finish here makes these a great warmer weather , easy lipstick. 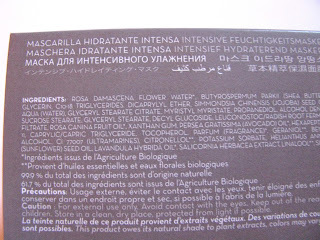 Flower is Made in USA and Not tested on animals per their labeling. Part of Pixi's spring offerings is this Eye Glow Cube . 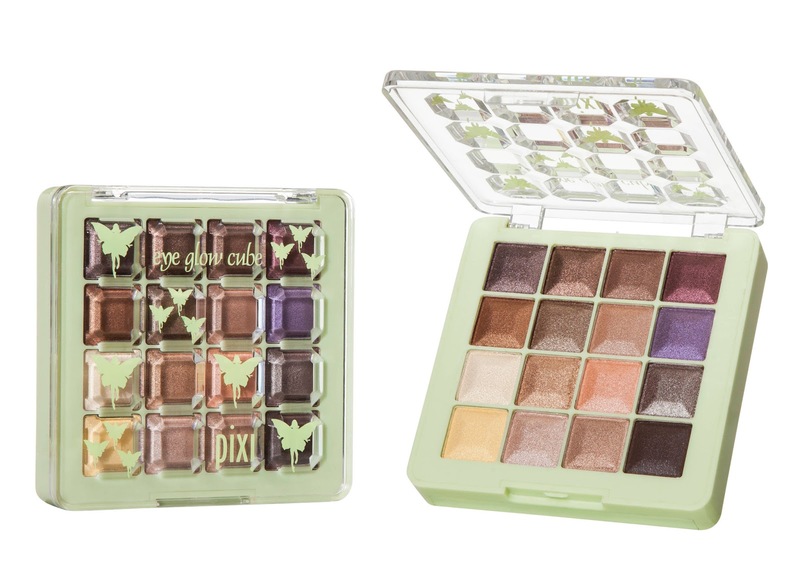 New to pixibeauty.com and Target, it's $ 28 and has 2 eye base powders, 16 eye shades + 2 duo applicators. The bottom slides out with the 2 base shades. New for March and only available in March, are new Electric nail colors from Maybelline . Bright , bold, neon , these are right on trend for spring . Like other Color Shows , these are 3.99 each and big 3 free. It's that time, time for the annual Estee Lauder Bronze Goddess collection. It's always a favorite of mine since I love all things bronze , and usually the one EL collection I love the most. This year there are some new additions along with new versions of old favorites. What looks coolest to me ? The rollerball lip glosses, Pure Color Sheer RollerGloss. Can we say grade school Bonne Bell for grown ups ? How cute are they? EL says they " feature a metal roller ball applicator and contain a formula of fruit extracts for lips that look hydrated and supple. Lightly flavored with a hint of either Passion Fruit or Guava Lychee". Shades are Succulent and Squeeze. Look for Bronze Goddess on counter in March. With the winter wind and cold still going strong, it's a 20 degree wind chill here right now, hydration is key. Face and body. 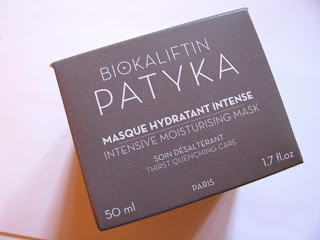 If you have dry skin and need a moisture boost, Patkya has a new mask out , Intensive Hydration. The text on the box calls it " Thirst Quenching Care " . Patyka is Parisian brand that is Eco Cert certified organic as well as One Voice (France) for using no animal testing on products or ingredients . Intensive Moisture Mask has rose flower water, shea butter, glycerin, jojoba seed oil and avocado seed oil for hydration, and hexapeptides for anti-aging. One unique feature is the product dispenser. There is a small concave hole in the top that you push down on . This keeps the mask free from contaminants. I've long been a fan of this brand dating back more than 5 years ago when I first smelled their , now discontinued, fragrances. While I don't need this much moisture for my skin, I have no doubt this would be wonderful on drier skins. I tested it on one hand and it was softer. You leave the mask on for 10 minutes , tissue off, and follow with toner. Patyka is not the easiest brand to find in the US but it is available at Dermstore.com for $ 95. 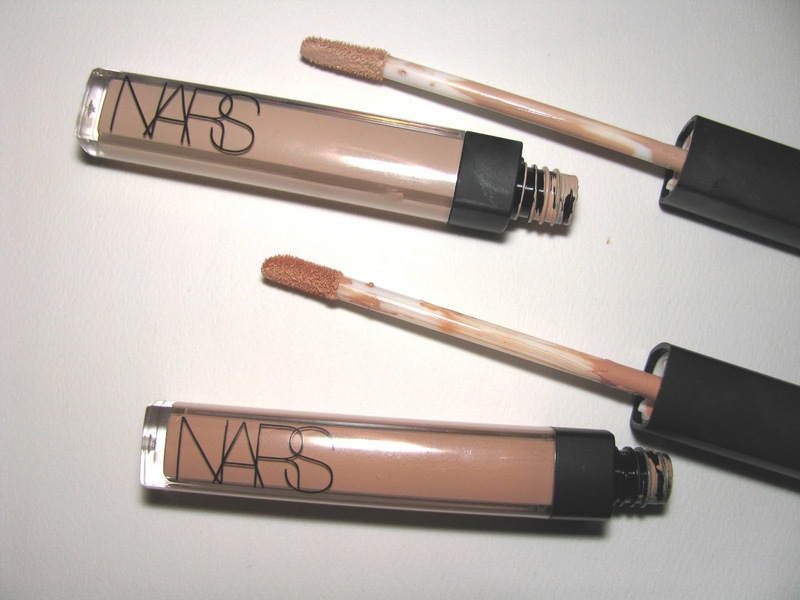 NARS continues to help us perfect our faces. 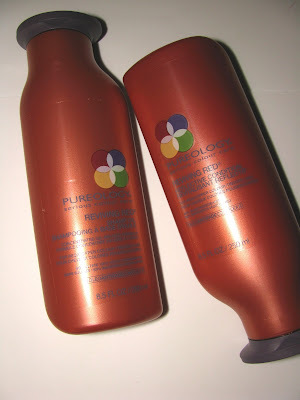 First up was the wonderful Pure Radiant Tinted Moisturizer. It's the only TM I use, with it's good coverage and BB like look . And truthfully, it's better than many of my BBs. It just gives you glow. Coming later this year is Radiant Cream Compact Foundation. That previewed at fashion week . On deck now is new Radiant Creamy Concealer. Concealers are a product I haven't used/explored as much as some others, but in the past few months I've begun using them almost every day . Since I've yet to try tons of them and I've yet to find a firm favorite , knowing the goodness of NARS I was happy to take these for a spin. 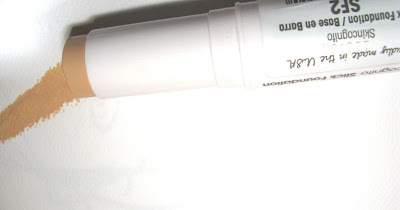 The concealer stands up to the creamy of it's name . It's thick, not runny and very blendable . You don't need a lot at each go, and it's moisturizing but not heavy or greasy. It's great under the eyes as it doesn't get/feel dry or caked. 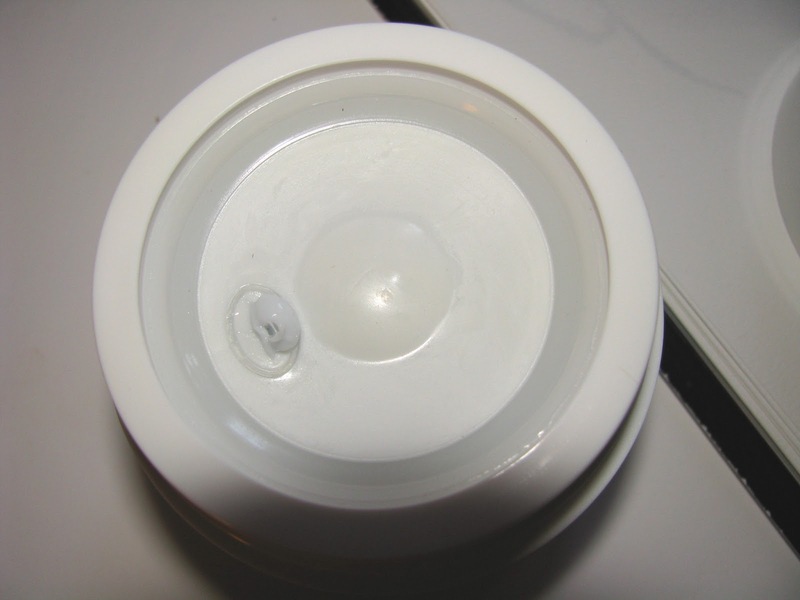 The pigment is medium to full with very good coverage. Wherever I applied, it covered easily and stayed that way. NARS says it's long wear as well and on me that proved true, bless them. I went much of the day with it still looking good and not wearing off. I can't say that about too many of the other concealers I've tried. 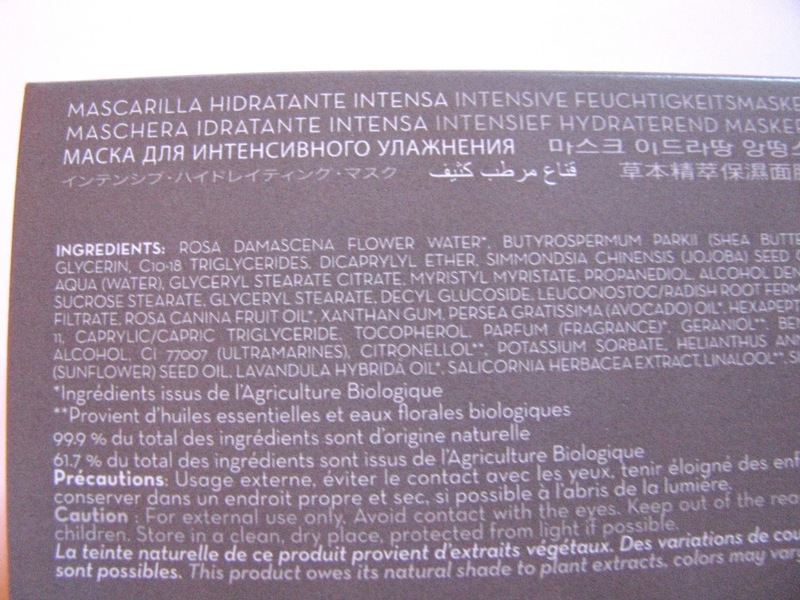 I didn't get a box so I wasn't able to peruse the ingredients, but NARS does say it is " enriched with hydrating skincare benefits". Looking for a new , great concealer? Then you need to give this one a try. Shades shown are Honey and Vanilla. There are 10 shades in all. Retails is $ 28 and it will be available Feb. 20 at NARS . 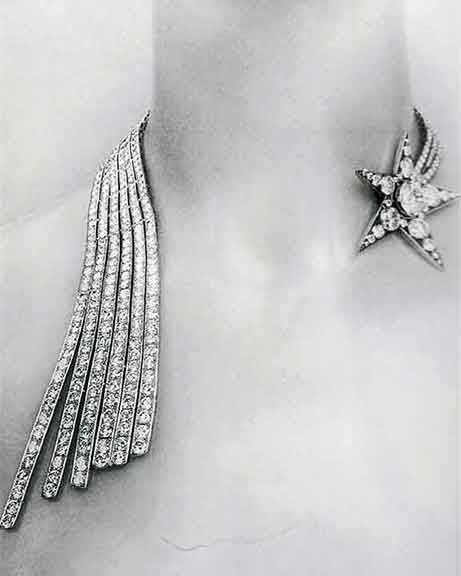 1932 was the year Coco Chanel staged an exhibit of opulent jeweled comets and stars made of diamonds. 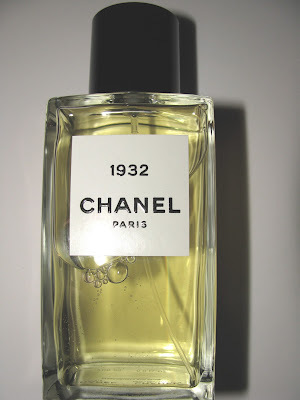 1932 is now the name of the newest Chanel Les Exclusifs fragrance in commemoration . 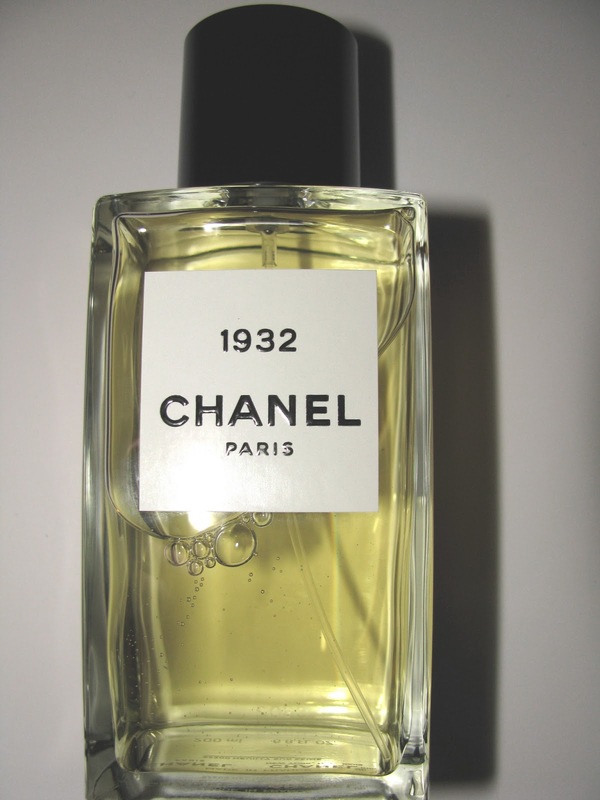 1932 is a lovely , really that's the word for it, light floral. It's very soft yet strong with good sillage and lasting power. White florals of jasmine and neroli begin it along with citrus and throughout there is always the hint of the vetiver note. Soft rose is there, but it not a rose scent, and it also flashes dry at times which is the iris note . That iris stays fairly current throughout the drydown. 1932 has a powdery quality which is something I usually don't take to, but here I like. Even though woods notes are said to be in there, I get very little of them. Bits of musk and a touch of vanilla. but it's the florals, iris and vetiver, that stand firm. It's a romantic type of fragrance and one that would never be out of place. 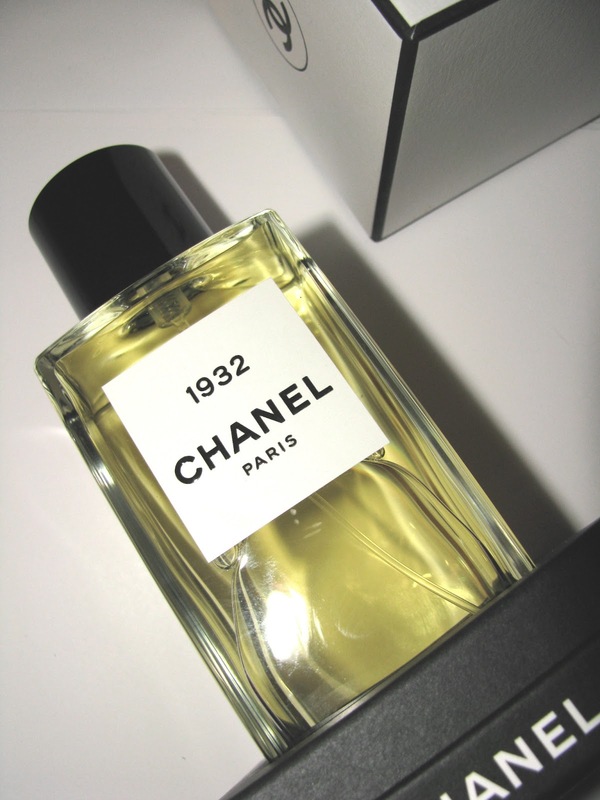 Jacques Polge, perfumer at Chanel, says that 1932 was created "petal by petal". Available at Chanel.com as well as select retailers. Saks and Bergdorfs being the places you usually find the Les Exclusifs. Now that New York Fall 2013 fashion week is done we can parse a few trends both beauty and fashion, from the looks that went down runways. Yes we are talking fall when spring hasn't arrived, I know. But that's how the industry goes. And if you hit the very end of winter sales you may find something now that will be perfect then, but cheaper. Black leather - This is the trend that will stick. It was all over . Black was all over in all fabrics. Herald the return of black. Fur ( preferably with black leather)- Faux and real were both very popular, even more so if the fur topped a leather coat. Military/grunge- Prabal Gurung did it brilliantly but it showed up in many more shows incl. camo prints at Kors. Plaid- Houndstooth at Kors, windowpane at Victoria Beckham, traditional multi at Emerson and more including Marc by Marc Jacobs, Suno, Billy Reid and Rebecca Minkoff , plaid was a pretty look. Peplums- They're still going strong for fall. Dark nails and nail art- While there didn't seem to be one big trend these two showed staying power along with bare nails as well. 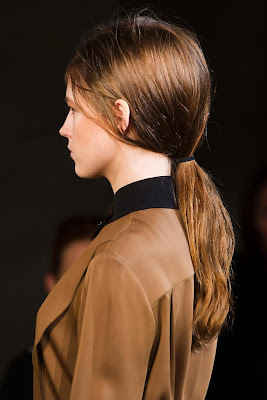 Slick hair and low ponys - Are still the main runway look. No mascara - Oddly the no eye makeup look was popular. Count this as one trend I do not think will catch on. Leave off mascara? Nope. Burgundy lips- The bold burgundy lip goes strong for fall again. This time even deeper than before. Oils are the word in haircare right now. Hair like most things has trends, cycles etc. And ultra hydrating haircare with oils is very much what's new . It's is wonderful for those with drier hair. For many years it was hard to find something that moisturizing . Even I use a little spray in light oil on the dry ends at times , although oils are be too much for my hair mostly. Backstage at fashion week, Redken debuted their new Diamond Oil line. Diamond Oil includes Shatterproof Shine , an oil that can be used wet or dry and works great not just for moisture but if you want to sleek back your hair like the look seen at Victoria Beckham by Redken's Guido Palau. It also makes a great leave in on a beach day which since Diamond Oil launches in May , will be good timing.
" delivers a nourishing blend of natural apricot, camelina and coriander oils. Each of these oils were chosen for their unique ability to target different layers of the hair due to their molecular weights. The 2 oil treatments contains 99% natural oils and are silicone-free, which allows the oils to better penetrate to the core. Hair is fortified and conditioned , sparkling with prismatic diamond-like shine." The line also uses Redken's Interlock Protein Network™ (IPN). There will be a whole line consisting of shampoo $ 18, conditioner $ 19, Deep Facets Oil Enriched Intensive Treatment $ 20, and the oils itself which comes in 2 versions- Shatterproof Shine ( for medium hair) and Shatterproof Shine Intense ( for coarse hair). Both are $ 40 each. Narciso Rodriquez has a line of fragrances truly his own. Not simply his name, but his own olfactive style. We recognize the bottles as well as what's in them. New and in the same vein but yet subtly different is L'Eau or per the brand - l'eau, for her. ( That lowercase is driving me nuts while writing this). soft , there is less musk than the previous versions and it dries to a light , easy , quiet but pretty fragrance. It is weekend worthy as well as office friendly. Other notes listed are Jasmine, lily of the valley, cyclamen, musk, and a woody amber although to my nose there are minimal woods. Maybe enough to ground the scent but not enough to impact what you smell that much. Eau de Toilette Spray 1.6 oz (SRP $77.00 USD) and 3.3 oz (SRP $104.00 USD). Available in February at Saks Fifth Avenue, and in April at Bloomingdale’s, Nordstrom, Neiman Marcus and other fine specialty stores nationwide. When you are a beauty person you are always on the lookout for what's new. 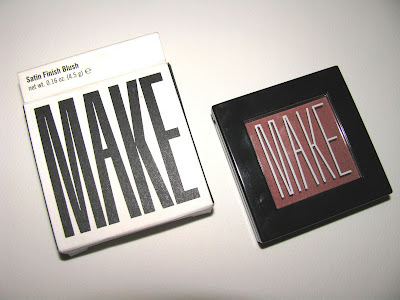 I had never heard of MAKE before but it looked and sounded nice, so why not try it ? MAKE is by and for sale on We See Beauty at WeSeeBeauty.com - a for-benefit marketplace of ideas, stories and products that support the cooperative movement. One-third of all MAKE product sales will support the non-profit organization, the We See Beauty Foundation, dedicated to incubate and accelerate women-led, worker owned cooperatives. The foundations first project is establishing a cooperative in Brooklyn, NY called Do Good Be Beautiful, that will create and sell its own healthy cleaning and personal care products. The makeup itself is high quality and very pigmented . All things to look for in a good product. I've tried the Satin Finish eyeshadow, Satin Finish Blush , Soft Focus Foundation and Luminous Lip Gloss. 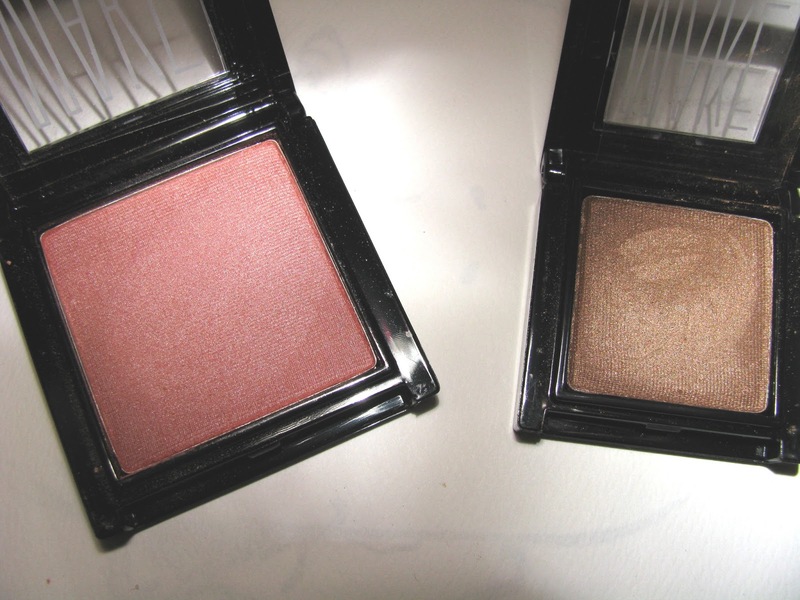 The blush $ 22.50, ( in Terra Cotta) and eyeshadow $ 18, ( in Teak) both have a plush, creamy feel, go on easily, blend nicely and as I said have good pigment. The blush especially is full color . The lipgloss $18, ( Date), is shiny, not too sticky with good coverage. There is no shimmer in the Luminous shades . It does have a strong peppermint scent. More than I would like, but that's a personal taste thing. 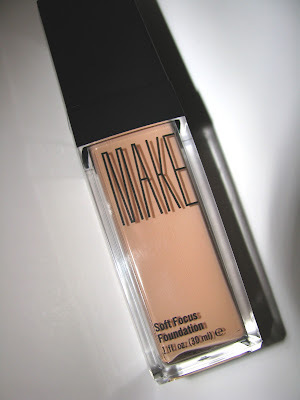 The Soft Focus Foundation $ 32.50, might be my favorite of the line. It offers full coverage , smooth skin, and light hydration . It has natural extracts like Panax Ginseng Root and Centella Asiatica which MAKE says help to reduce shine and conceal pores.